"Oh, I wouldn't like to be an earl, since Mr. Hobbs says they cut people's heads off." Sometimes words and phrases long outlive their sources. If you mention the term "Little Lord Fauntleroy" to just about anyone it immediately conjures up a visual picture, but precious few living have ever read the novel of that title by Frances Hodgson Burnett. It's pretty standard Victorian stuff, but the character of the title personage has indelibly been marked in the popular imagination as a representation of the effete and ineffectual titled nobility, complete with feminine curls, velvet suits and outlandish collars. This interpretation by Mary Pickford, in an amusing dual role, strives hard to put the spunky boy back into the character, though it's not always successful. Cedric Errol (Pickford) is a rough-and-tumble boy in New York of 1885, living with his mother, referred to as Dearest (also Pickford). Cedric's a mischievous scamp who wears rings in his hair as a memento of his long-gone father. As it turns out, that father was the only son of the Earl of Dorincourt (Claude Gillingwater). When that intervening generation suddenly drops dead of dissipation, the Earl sends for his unseen grandson, since someone must carry on the line. Dearest can come as well, but must stay in the cottage on the grounds and not enter the castle, lest she remind the Earl of his son's indiscretions. Cedric becomes the Lord of Fauntleroy, but far from being the greedy title-seeker his grandfather expects, he proves to be generous and kind to the Earl's tenants and generally adorable. Even the crusty Earl is won over by the boy's charms, but then a rival claimant to the title comes out of the woodwork and threatens to completely upset affairs in the Earl's household. This film represents a pretty amazing piece of trick photography, with Dearest and Cedric frequently sharing the same scene but appearing to be completely different in scale, anticipating similar tricks in Lord of the Rings by 80 years. Pickford would spend entire days getting shots that last only seconds, but it was worth it. Nearly every moment in the film that she serves these dual roles (and there are many of them) feels like two different people who just resemble each other strongly. It's an acting tour de force that serves as a good hook for the audience to get drawn into the admittedly stilted story line. Pickford is a bit less accomplished at convincing us she's really a boy when she essays the role of Cedric, despite two separate fistfights and generally mimicking the active nature of her brother Jack (who also got a director credit on this film). In addition to the cleverness of the double exposures and scale work, the film has plenty of excellent production values. The enormity of the Earl's castle and grounds are striking, and they feel quite real. Similarly, the streets of 1880s New York have a verisimilitude that is completely convincing (though I'll admit I'm not quite so old as to be able to recall them). The supporting characters are fairly broad in their portrayals, but there's very little of the extreme and melodramatic performance style often associated with silent films. 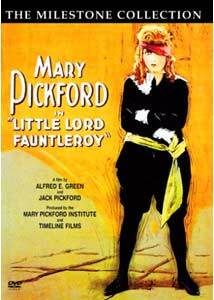 Pickford in particular plays her roles with a very naturalistic feeling that holds up quite well even today. Her New York friends, played by James Marcus, Kate Price and Fred Malatesta carry some dubious ethnic baggage (not to mention some sloppy makeup jobs), but they have a sincerity and earnestness that's quite appealing. Colin Kenny, as Bevis, the rival claimant to the Fauntleroy title is as thoroughly unlikeable as Pickford is utterly charming, so there's certainly no question as to whom the audience will be rooting for when they face off in a ruckus through the castle. It's a entertaining little jaunt of nostalgia that manages a fair amount of humor while not going overboard on the pathos. This would be a decent picture to introduce someone to Pickford's talents and charms. Image Transfer Review: The original full-frame image is presented from a period sepia-toned print. It's fairly worn, as one might expect from such a popular picture, with hardly a frame without a scratch, nick or other minor damage. But the image is quite crisp, clear and attractive notwithstanding the wear of the years. Most of the titles appear to be originals, and others have been re-created to closely resemble them. Little artifacting or aliasing was visible most of the time. A major restoration would have been nice, but hardly practical in the world of limited commercial exploitation of silent films. Audio Transfer Review: Nigel Holton provides an orchestral score for this film, and it's actually performed by an orchestra rather than a synthesizer, which always merits a plus. The score isn't necessarily authentic but it's quite appropriate without undue mickey-mousing to the action. I was quite pleased with the quality of the writing, and there's nothing to complain about the recording, which is free from hiss and extraneous noise. Stereo separation is quite adequate and no clipping or other problems were observed. Extras Review: Two galleries are provided on the disc in the form of slide shows. One is devoted to the feature, and includes 17 stills, a postcard, advertisements, a full set of lobby cards, posters, window cards, and glass advertising slides. A second gallery provides stills and advertising materials relating to Pickford's life and career more generally, though it's too brief to really do a very good job of that (it's shorter than the gallery for the feature). Finally, there's a 13-page .pdf file discussing the film and providing excerpts from the writings of Kevin Brownlow regarding Mary and cinematographer Charles Rosher. There's even a recipe for the Mary Pickford cocktail, should you be so inclined. If you ever wanted to see why Mary Pickford was called "America's Sweetheart," you need look no further than this picture. Utterly charming in a dual role, she can win the heart of the stoniest earl or most jaded DVD reviewer. A reasonably good transfer but not much for extras.